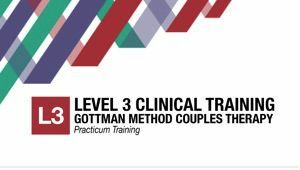 These Gottman Professional Training Workshops provide you with research-based instruction and resources that you can use immediately with your clients in couples counseling. There are 3 levels in the Gottman professional training program. You may train in one, two, or all three levels. Each level provides you with a progressively deeper level of instruction and understanding. Upon completing each level you will receive a certificate of completion from the Gottman Institute. Completion of all 3 levels of this program concludes with the fourth and final level - the Certification Track, leading to your designation as a Certified Gottman Therapist. Earn up to 52 CE’s! 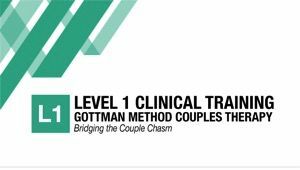 We offer all three Gottman professional workshops: the Level 1: Bridging the Couple Chasm, the Level 2: Assessment, Intervention and Co-Morbidities, and the Level 3: Practicum Workshop in Gottman Couples Therapy. These trainings are presented in a live presentation format. The Level 2 workshop is now presented in the new 3-day format. Each day’s presentation runs approximately eight hours - see workshop outline for exact times and details. *** Discounts are available for registering for both a Level 1 and Level 2 training; both a Level 2 and Level 3 training; or All Three Gottman professional trainings; and for groups of 3 or more. See registration page for more info or call Patricia at (703) 208-9988. Integrate research-based methods to maximize your competence and inspire transformation in your counseling practice. Receive a 300-page Clinical Manual featuring new relationship assessment questionnaires and clinical interventions. See on film Dr. Julie Gottman use all of the main interventions with a real couple. Receive a certificate of completion from the Gottman Institute. Gottman Level 1 Training - Click Here! Registration Information Page - Click Here! Presented by Scott Wolfe, Ph.D. Deepen your understanding of the Gottman Method. Practice using Assessments and Interventions in group role-plays, view demonstration films, and participate in extensive discussions as you learn the Gottman Method. 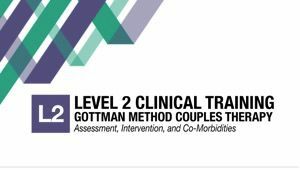 Become skilled in using our Level 2 Clinical Manual including revised Gottman Core Assessments, Gottman Supplemental Assessments and more than 50 Gottman Interventions. Gottman Level 2 Training -Click Here! Registration Information Page -Click Here! Effectively use the Oral History Interview during a couple’s assessment and understand its implications. Clearly explain to a couple their strengths and challenges in terms of the “Sound Relationship House”. Help Partners identify their own “Four Horsemen” and understand the antidotes. Select and utilize appropriate tools to help a couple deepen their “Friendship System”. Gottman Level 3 Training - Click Here!! Gottman Level 2 Training - Click Here! Couples Therapy Training for Therapists - Couples Therapy and Workshops for Couples.